Aidy Bryant plays a young journalist named Annie in the Hulu comedy Shrill. The series is based on Lindy West's 2016 memoir. 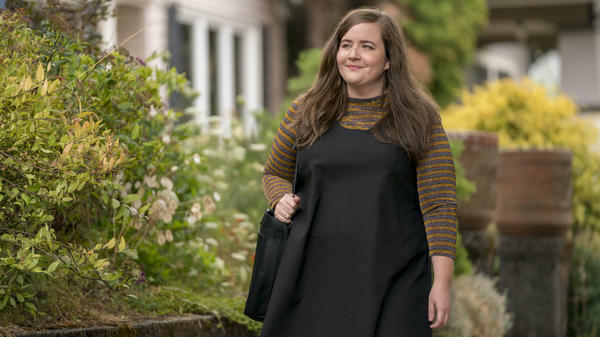 Aidy Bryant mourns the time she lost in her teens and early 20s feeling self-conscious about her body. The Emmy-nominated comic and actor says she lived in fear of judgments about her weight. "I felt like the worst possible thing that anyone could ever do would be to think that I was fat, to call me fat," she says. Bryant began to direct her energy into her writing and comedy career. She moved to Chicago to pursue comedy at Second City, and in 2012, became a cast member on Saturday Night Live. Bryant is still on SNL, and now also stars in the Hulu comedy series Shrill, based on Lindy West's 2016 memoir. The series centers on a young writer named Annie who is described as a "woman who wants to change her life — but not her body." It's a perspective that strikes a chord with Bryant. Looking back now, she says, "the second I stopped being afraid of someone calling me fat, I was able to start to focus on my goals and my dreams." I think part of what compelled me to want to make this show was I got to Saturday Night Live and I thought, "I made it. I made it. I got the dream!" And then I got there and I would do photo shoots with my castmates, who are smaller women, and they would have 50 dress options and I would arrive and I would have two, and they both looked like something that the mother of the bride would wear — and I was 25 years old. I just felt, like, this isn't fair, and it's not my fault. I came here. I did my job. I'm funny. I wrote my way to this position, and now a stylist or a magazine or whoever is responsible, like, it's their job to dress me, and dress me appropriately for my age. Those were the kind of moments where I was like, "I want to talk about this." One of the things that we were doing in the writers' room was talking about these specific experiences that were in Lindy's book, and so many of them are so universal, even though the specifics might be different. I had had feelings of feeling embarrassed or shamed, or I had ordered something different because I didn't want to be seen as a fat woman eating pizza. Things that Lindy specified, I was like, "I have an experience just like that!" So quickly, with our writers' room, I think those universal experiences became more specific through me and Lindy and all the other writers. It's weird, because I think, even though sometimes people have said things that are hurtful to me, I immediately am like, "That's OK! That's OK!" You know? I think one of the things that the show is about and that I've discovered even more recently, I now feel more comfortable sort of pushing back, and stopping and saying, "What do you mean by that?" I think one of the things about school for me was I really learned how to be nice to everyone and to make everyone like me. And I think in a lot of ways I've spent a lot of time unlearning that, if that makes sense. I think I thought surviving was being every single person's friend and trying to be liked. Like, here I am going to prom, I'm named prom queen, but I hated myself. So it's not like I look back on that as like, "Oh, my beautiful prom night!" I just remember that I wore a strapless dress and the whole night I was like, "My arms are so fat," and that is my main memory of that time. It's incredibly nerve wracking, and I honestly I couldn't eat, I couldn't sleep, I was so nervous. I was really fortunate in that [SNL Executive Producer] Lorne [Michaels] and a few of the other producers had come to Chicago and they had seen my Second City show. And so that's where they saw me and so they had seen me do two hours of comedy, so I felt really lucky going in, knowing I only had five minutes. I was like, "Well, they've seen me in front of an audience and they've seen me do the stuff I'm most proud of." It is really intimidating. You stand in the spot where the host does the monologue, kind of center stage. We call it "home base," and you just do your five minutes. I had really been warned like, "They're not going to laugh, just expect no laughs. Just sort of plow through it." I got some laughs, and so I was like, "OK, I can, I can make it through this!" It's just over in a blink of an eye. And then you walk off and you're kind of like, "I guess I did it. It's over." I really thought, "OK, I auditioned for SNL and then I'll go home, and what a cool experience! That's it. It's over now." And then it wasn't. One of my favorite things about SNL is how technical it is. And I think people underestimate, like, when you see the greats of SNL, part of what makes them great is they have a huge technical understanding of what's happening, because it really is about [how] you have to hit your marks and [how] you have to look at the right set of cards, and then for this shot you're looking at a different set of cards, so that it looks like you're looking at the person. You really are tracking things on, like, four different levels, which is your comedy performance, but then knowing that you're on camera in the right camera, and then you're reading things and tracking your eye line. It's extremely, extremely technical. And I love that part of it. A lot of times you're reading [cards] for the first time live on air. But now those are my favorite times. I think it used to really scare me, but now that's like when I find it extra exciting, and there's kind of an energy in the air where everybody knows, like, are we going to make it? Are we going to land this plane? And there's nothing better. (SOUNDBITE OF JIMMY AMADIE'S "YOU'D BE SO NICE TO COME HOME TO") Transcript provided by NPR, Copyright NPR.